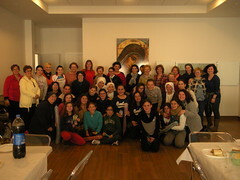 Seventeen girls from Macael took advantage of a long weekend in Andalucía to go on a great "pilgrim/get together" in Granada, Rocío and Seville, in a trip completely directed by Our Mother. 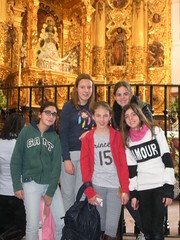 To be able to cover the costs of the trip, the girls sold tickets for a raffle of a painting of the Virgin Mary and a music CD. They also prepared sweets/candies, which they distributed in exchange of a donation. We want to take a minute to express our appreciation to everyone who helped us with their contribution. Finally the awaited day arrived: on Saturday at 8 o'clock in the morning the mini-bus left from Macael driven by our friend Juan who is always-available to bring us here and there. Although the ages of the girls ranged from 12 to 23 years old, a tight-knit group was formed. On the bus, between songs and games we prepared ourselves for what we would see on our first destination: Granada. We arrived around mid-morning and went directly to the Mirador of St. Nicholas, where we were able to contemplate a panoramic view of the whole city, including the Alhambra. Then we went to visit the crypt of Blessed Fray Leopoldo of Alpandeire, where we heard Mass and had the opportunity to visit the museum next door, which holds many of the personal belongings of the Blessed. There we met up with two sisters and three girls who came from Alcalá de Guadaira to spend the rest of the "pilgrim/get together" with us. We then went to the Church of St. John of God, what a grace to be able to climb up to the dressing room where his mortal remains are kept! We also could see many other relics of the first saints and martyrs, among them the Apostles. Then we went to venerate the remains of the Catholic Kings in the Royal Chapel and then went to the Basilica of the patron saint of the city, Our Lady of Sorrows, where we were very well received and we were able to have lunch and rest. Before resuming the walk, we had the opportunity to go to the dressing room to say hello to the beloved Patron Saint of Granada. Once again we got on the bus headed now to Alcalá de Guadaíra. We stayed in the parish halls of Santiago that had been prepared for us with much excitement for those days. The sisters of Alcalá and the group of lay people of the Home received us with a lot of love. After situating ourselves and having dinner, a great surprise awaited the girls. We went up the hill to the shrine of Our Lady of the Eagle, and before entering, a sister who was by the door, explained what we had to do next. 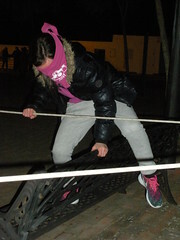 Blindfolded and clinging to a rope, we would travel through several obstacles, while some "bad" voices would try to discourage us and confuse us, and other "good" ones would encourage us. To what voices would we listen? The most important instruction that we received was NOT TO LET GO OF THE ROPE, no matter what happened. One by one we went through the entire course until we reached the end, which was the inside of the sanctuary, at which time we took the blindfold off the eyes to come face to face with Our Mother. Then they gave us all a letter from Jesus and a sentence to meditate on during the days that the get together would last. The next day, Sunday, after having breakfast and doing some prayer, we travelled by bus up to Rocío, where another surprise waited us. 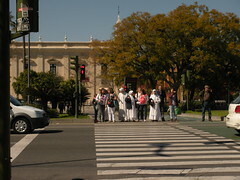 Rocío was overflowing with movement, music, people and horses due to the Masses of the Fraternities that were being celebrated that day. It seemed that Our Mother wanted us to see Rocío with all its life and color! At the Mass the local choir from Rocío sang, and although we had to remain standing up because of the amount of people that were there, we were touched and grateful for the great devotion shown by the locals to the White Dove. The girls also had time to take part in a photographic gymkhana. We ate at the house of the Fraternity of Rocío of Alcalá, who were very kind with us. In the afternoon we went to the nature park of the Doñana, guided by some friends who joined us and gave us some explanations about park. In this nature reserve we were able to contemplate the beauty of God's creation. 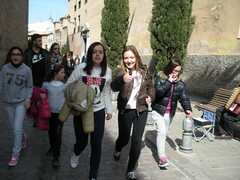 We then returned to Alcalá so that the girls could have time to prepare for what it had been for some - if not all - the best gift the Lord has given them in this pilgrimage-get together: a good confession. With this in mind we had a penitential Act, in order to make a sincere and complete examination of conscience. A very good priest came to confess the girls and nearly all took advantage of this great opportunity. Some of them left the confessional crying, after experiencing the tremendous feeling of peace that comes from the reconciliation with God. Now with a clean soul and a renewed spirit we got together to do some hand crafts. And at night, after having dinner, we had the “Great Festival“: an evening with hilarious performances where they all shared their talents with others: poetry, dance, rhythmic gymnastics, folkloric dances ... Exhausted but happy, after a good night story we went to bed. On Monday, March 2, we woke up with the desire to see that city "that has a special color', Seville. So we ate breakfast, prayed, and got on the bus. We spent the whole morning visiting its impressive cathedral, the largest in the world. What a great ability God has given men to make beautiful works of art! I hope that our soul is an even more worthy and beautiful cathedral for Him. We could not leave without first going up to the famous Giralda tower, where one could appreciate the beautiful view of the city. Then we went to María Luisa Park and the Plaza of Spain, where we ate our sandwiches. Our Mother is always attentive to all the details, although they escape us. And the fact is that She was the one that truly was organizing and leading our "pilgrim-get-together". We had the hope of visiting St. Angela of the Cross, but we did not know if they would allow us to see the museum dedicated to her. We did not realize that March 2nd is precisely the feast of this saint and the only date of the year in which the museum is opened all day! 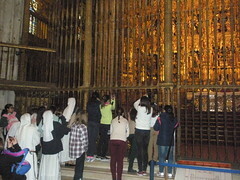 We were able to see the relics of St. Angela, including the wooden platform where she slept and the one she died on. In the chapel we prayed in front of her incorrupt body. And this was not the only gift: when we got there, there was a short line to go in so our wait time was short, but by the time we left the museum the line was all the way down the street. Thanks, Mom! From there, thrilled, we went to greet the Macarena, in whose Church we had the celebration of Mass and then went to visit the Museum, which houses beautiful statues which are taken out into the streets during Holy Week and other ornaments. In the meeting we had that night we shared our experiences and we talked about everything we had received during those days. Truly the Lord and Our Mother the Virgin Mary have gone overboard for us! The next day, after attending Mass at a parish of Alcalá and before embarking on the return trip, we had a game around the shrine of Our Lady of the Eagle. Afterwards, the girls received a small shield with their picture and their name as a souvenir of our trip. The ladies of the Home prepared us a delicious feast that we ate with great satisfaction. Thanks to all! With our stomachs and souls full, we said goodbye and started the journey back to Macael. The joy we felt made us sing during almost the entire trip, although some could not resist taking a nap. We all experienced in this “pilgrim-get-together” that our Mother totally spoiled us. We hope that we will not forget what we have received and let the seeds that the Lord and Our Mother have planted in our hearts during these days give abundant fruit. Olé! ¡Our Lady of Mount Carmel, our Queen and our Mother, bless our "pilgrim-get-together"!